Here is something about Vangelis' compositions, in particular two tracks featuring Sopranos: El Greco - Movement 4 feat. Montserrat Caball� vs. Direct - Glorianna feat. Markella Hatziano. In the music industry the release year we attribute to an album does not always reflect when it was actually recorded, and this is the case for many Vangelis releases. Come 1995, and the Foros Timis Ston Greco 3000 signed/numbered Ltd. Ed. set was sold only at the Athens Art Gallery with no commercial release at the time. I got that and listening to Movement 4 I thought it featured Markella Hatziano again, great, but then reading the the text it turned out to be Montserrat Caball� which was intriguing. I am not a classical opera connoisseur but I can pick differences as well as similarities and today I spent half an hour repeating a test I did years ago. a seamless track challenging myself to differentiate between the two Sopranos, musical composition and arrangement despite them being almost 10 years apart. So what does is tell me? Very strong similarities in composing and arranging, close to a copy , Caball� does hit lower notes and is more powerful (just a volume issue really) but maybe that's how Vangelis wanted it. Both have tremendous voices yet the Composer manages to get them to sound very similar many years apart. Not a critique, just an experiment, I wonder what some of you think? the waveforms were mere indications of how easy it was to bridge seamlessly 2 tracks in minutes & for the benefit of those not working with audio files. The topic is about the audio, Caball� vs. Hatziano voices and Vangelis' arrangements a decade apart. 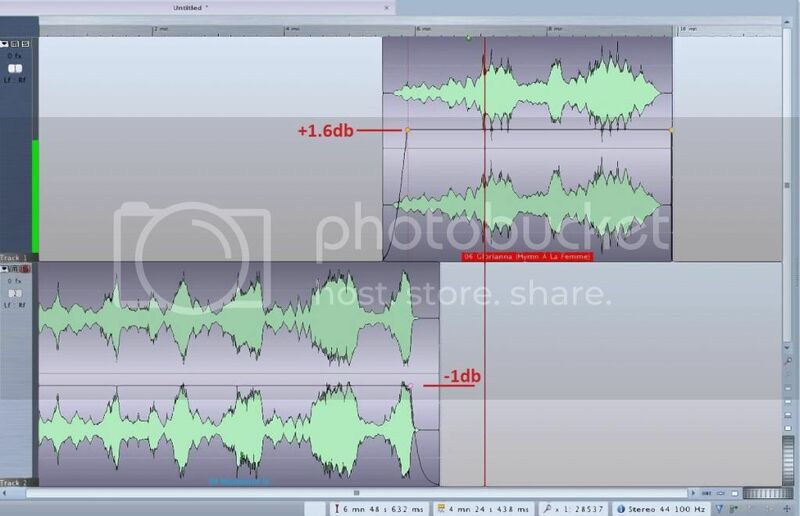 Forget about waveforms, just click on the link and listen to the sound cloud track, then come back with some comment on the audio performances and arrangments. I was only joshing with you, this type of thing is what I'd expect from someone whose work is not bound to technological advances but artistic choice and a very powerful vision. It's more than possible that Vangelis hit a point somewhere he decided was where he wanted to be and simply stayed there. Just as he might use the same phrase and intonation in conversation, he might do the equivalent in music so naturally he wouldn't even notice. We can but speculate. Ok, just wanted to ensure it's not one of my typical audio quality rants, this is all about the 2 Sopranos and Vangelis in between 2 tracks, years apart. Well, took some time to listen today - actually, if I wouldn't have known before, I guess I had bought it for just one track (with different parts, though). "El Greco: Movement Iv" by Vangelis, owned by EastWest U.K..
As a result, your track has been removed from your profile for the time being. If you think we&#8217;ve made a mistake, you can tell us about it by filing a dispute. Someone read this post & reported it to EastRest who found the interest in removing it, or, reliable software really exists to analyze actual digital content.